Shree FM Sri Lanka Live Streaming Online . Listen over 60 Sri Lanka FM Radio Stations live Streaming Online . Shree FM Sri Lanka online . Enjoy Live Stream of Srilankan Music News 24 by 7 Online . ALL FM stations Plays well in Google Chrome or Mozilla Firefox browsers . Please wait 20 seconds to listen FM(Player loading may take 20 Seconds).Refresh the Page once if FM is not playing after 20 to 30 seconds . Scroll down the scroll bar to find Play,Pause Stop buttons . Shree FM Live . Shree FM is a Sinhala radio station broadcasts island-wide on FM 100 and 100.2 . It is the flagship radio station of EAP Broadcasting Company Limited . 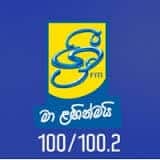 It has been ranked as one of the top-rated radio channels in the country by the Lanka MRB .